This shirt is ROWSINGLY SMART. My camera and lighting obviously didn't do it justice. It is a dark beige color with contrasting black piping and a BUCKING HORSE applique that is FANTASTIC. There is a slightly larger version of the applique on the back shoulder area. The curved front chest pockets are real, not just decorative. All of the "buttons" are black snap closures. 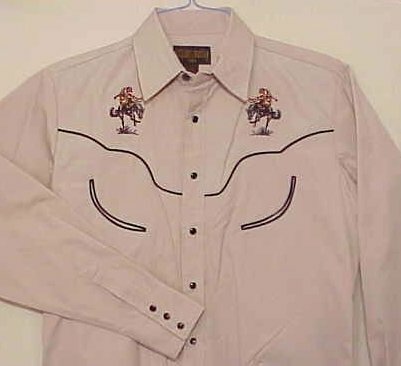 This has to be one of the most UNIQUE while being TASTEFUL western shirts that I have ever seen.